To get started working with tidycensus, users should load the package along with the tidyverse package, and set their Census API key. A key can be obtained from http://api.census.gov/data/key_signup.html. The function returns a tibble with four columns by default: GEOID, which is an identifier for the geographical unit associated with the row; NAME, which is a descriptive name of the geographical unit; variable, which is the Census variable represented in the row; and value, which is the value of the variable for that unit. By default, tidycensus functions return tidy data frames in which rows represent unit-variable combinations; for a wide data frame with Census variable names in the columns, set output = "wide" in the function call. To get decennial Census data or American Community Survey data, tidycensus users supply an argument to the required geography parameter. 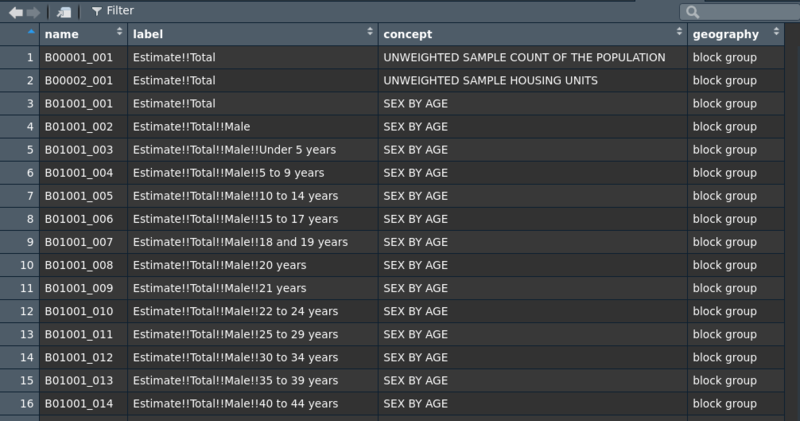 Arguments are formatted as consumed by the Census API, and specified in the table below. Not all geographies are available for all surveys, all years, and all variables. Most Census geographies are supported in tidycensus at the moment; if you require a geography that is missing from the table below, please file an issue at https://github.com/walkerke/tidycensus/issues. If state or county is in bold face in “Available by”, you are required to supply a state and/or county for the given geography. Getting variables from the Census or ACS requires knowing the variable ID - and there are thousands of these IDs across the different Census files. To rapidly search for variables, use the load_variables function. The function takes two required arguments: the year of the Census or endyear of the ACS sample, and the dataset - one of "sf1", "sf3", or "acs5". For ideal functionality, I recommend assigning the result of this function to a variable, setting cache = TRUE to store the result on your computer for future access, and using the View function in RStudio to interactively browse for variables. 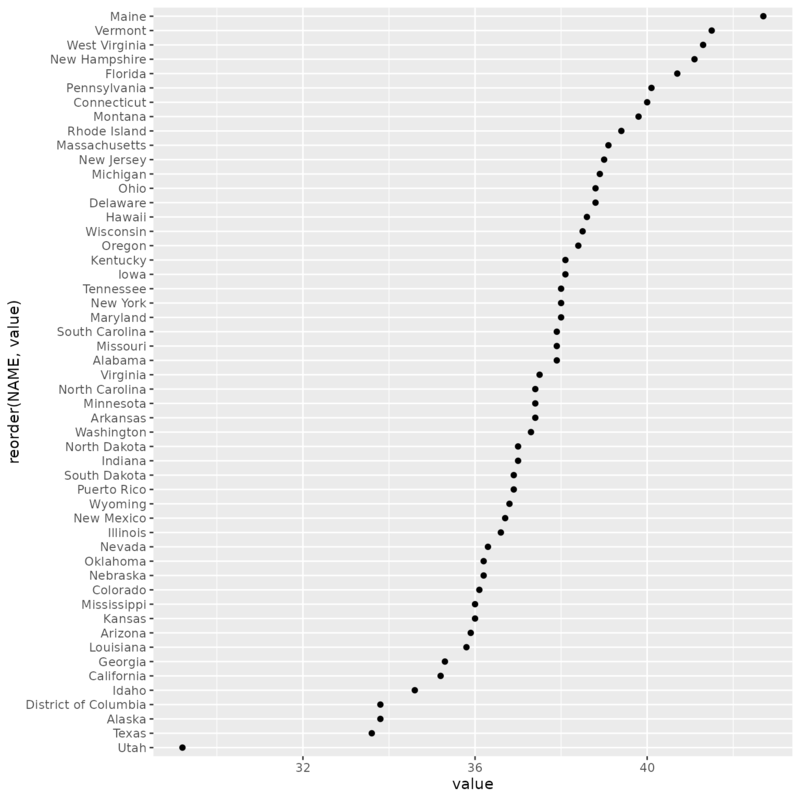 By filtering for “median age” I can quickly view the variable IDs that correspond to my query. American Community Survey data differ from decennial Census data in that ACS data are based on an annual sample of approximately 3 million households, rather than a more complete enumeration of the US population. In turn, ACS data points are estimates characterized by a margin of error. tidycensus will always return the estimate and margin of error together for any requested variables. In turn, when requesting ACS data with tidycensus, it is not necessary to specify the "E" or "M" suffix for a variable name. 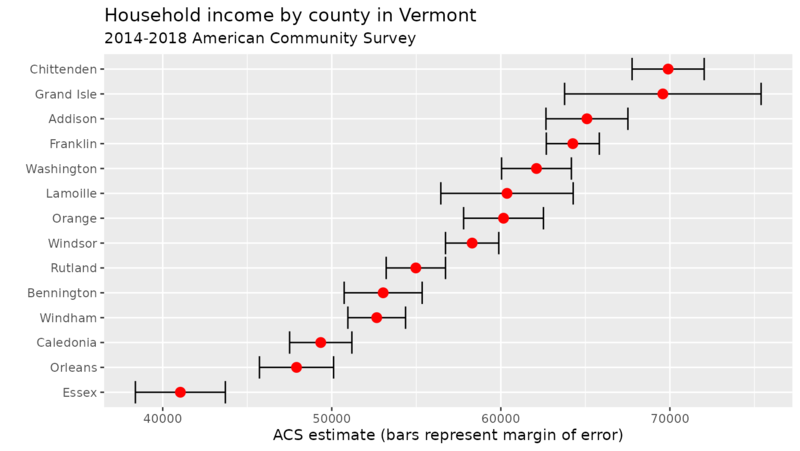 Let’s fetch median household income data from the 2013-2017 ACS for counties in Vermont; the endyear is not necessary here as the function defaults to 2017. The output is similar to a call to get_decennial, but instead of a value column, get_acs returns estimate and moe columns for the ACS estimate and margin of error, respectively. moe represents the default 90 percent confidence level around the estimate; this can be changed to 95 or 99 percent with the moe_level parameter in get_acs if desired.